Done as a Vector in Illustrator. My Little Pony Friendship is Magic © Lauren Faust and Hasbro. Love Soarin'! He's such a goofy pony. Yeah. I don't know what happened. Glad you could find a use for it. I like the steam overlay. ok...now I hate pie, thanks a lot! As much as i love Dashie and Soarin, I would feel simply awful ruining this perfect couple! 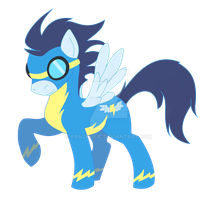 PieXSoarin'....so beautiful...I-I think I'm going to cry. IT'S SO TOUCHING!!!! Wow he's seem desperate for that pie. Thanks to Rainbow Dash, she saved the apple pie for him. im so gonna use this! ill give credit of course! Glad to hear. Could you please link me to the final product when your finished? Yeah I will! It will be done sometime next week! He just looked so happy when he got his pie.......it was at that moment that he became my second favorite pony. very good job on this !! Apple pie is one of my favorites as well. om nom nom nom. Awesome work. It's going to be hard to find a pie quite as good as the one he had. So cool!!! I laughed a lot when I watched Soaring enjoying his apple pie!!! Thanks a lot for that!! You made my night!!!! I'm really glad I made your night!